In London this evening? You might want to pop into St Leonards in Shoreditch, don't let the hipsters deter you. @adamdonen Album launch! I will be joining @adamdonen on the Piano Forte for a few songs and @_rafando are rather good as well and also launching their new album. A few photos from Perfect.Murder. From Andy Anderson on Facebook: "Robert Smith, had dedicated Shake Dog Shake, to me, at the RAH on Saturday night, I didn't hear him say it, because I was sitting halfway back in the Box (my choice, so I could take some photo's) but the folks I was with, told me. I'm very honoured by that big time, and always will be. I met Robert after the show, for a quick chat, and it was like no time had passed between us at all." See/hear it here. "last weekend, thanks to the teenage cancer trust (tct), roger daltrey and royal albert hall – where i played two benefit shows for great audiences with my bandmates in the cure -- i had the wonderful opportunity to visit with two groups of teenagers from all over the u.k. who are at different stages in their fight with cancer. some are just beginning the fight... others are victorious and already giving back energy to their brothers and sisters in battle. on saturday afternoon, i was invited to watch the tct gang perform 2 songs they had written about their time with the disease. it was an incredibly moving experience, made more powerful by their joy, bravery and determination in the face of the big C.
that is why we were performing... that is what put the fire and heart in our performances. we played for all those that were there, all those we met and those we may never meet. thank you teenage cancer trust for the honour and opportunity to help in some small way. For more about Michael, his story, and other ways to support him, check the Ride For Michael website. Congratulations to the winning bidder! £2,751 raised to support Ride For Michael. Well done! 1. Robert Smith isn’t as miserable as everyone thinks. Often pegged as the lord of indie gloom, Cure frontman Robert Smith has written some of the most heartrending break-up songs of all time (‘Disintegration’, ‘Pictures of You’, ‘In Between Days’). Surprisingly, though, cheerful Bobby’s love life is pretty sorted: he’s been married since 1988 to his childhood sweetheart Mary Poole. They’re officially the world’s cutest goth couple: he was Tim Burton’s inspiration for Edward Scissorhands, she apparently ‘used to dress as a witch to scare little children’. 2. Age hasn’t mellowed him. By the time they reach their mid-fifties, most rock frontmen have cut their hair and started dressing at least vaguely sensibly. Smith’s world-famous barnet – greasy, backcombed and thoroughly frazzled – is more out of control than ever, and he’s still rocking the lipstick and eyeliner look that he made de rigueur for sensitive teens in the ’80s. He’s 54. Star. 3. Their first proper frontman was Peter O’Toole. Unfortunately, it wasn’t the late star of ‘Lawrence of Arabia’ but a ‘demon footballer and Bowie fan’ from the band’s home town of Crawley. He sang with them for a few months in 1977 then went to work on a kibbutz in Israel, leaving Smith in charge. The rest is goth-pop history. 4. They had the best band nicknames. Laurence ‘Lol’ Tolhurst met Smith when they were both five years old, and went on to play drums and keyboards for The Cure for 13 years. Which means that for more than a decade, a key member of the UK’s mopiest pop group was called Lol. 5. They never leave an audience wanting more. The Cure’s 32-song Bestival set in 2011 lasted two-and-a-half hours.Their last few tours have seen them perform three albums back to back, plus encores. Okay, their tickets aren’t cheap – but you can’t deny that you get plenty of Bob for your buck. In the run-up to the annual Teenage Cancer Trust gig series at the Royal Albert Hall last week, the charity’s website noted that the Friday and Saturday headliners, The Cure, would be playing three-hour sets, with no support act. In the event, they were onstage for around three-and-a-half hours, slotting in 45 songs each night. That’s pretty remarkable (though their 50-song, four-hour show in Mexico City last year is the one to beat), bespeaking a fan/band relationship where the passion has only increased over the years. Going by reaction on Twitter, many people considered it one of the best shows they’d ever seen, and reacted angrily to reviews in the Guardian and elsewhere that suggested there could be too much of a good thing. Stop Dead - London, Teenage Cancer Trust 29-Mar-2014 from itsaperfectday on Vimeo. Interesting about Andy's album cover for 4:14. So something like the photo Robert posted here? "AS CLEARLY AND SUCCINCTLY AS I CAN..."
Robert has a LOT to say today! Official site updated with response to the ridiculous negative spin that the online music sites put on his XFM interview, and lots more. This is just a portion of it. Please go read the entire post. Thank you, Robert! Epic Cure smackdown of UK press! TO BE CLEAR – AND ON THE BEST AUTHORITY - THE BAND HAVE INDEED READ THE REVIEW - BUT DID NOT LIKE IT! THE REVIEW WAS – TO PUT IT POLITELY - LAZY NONSENSE… swampy… numbing… yet to work out how to build up a show… GULP!!! From Roger on Facebook: "I am very proud to announce in association with Les Saisons Russe our production of The Picture of Dorian Gray - The Ballet. We have been working on this project for two years ago and today at the Russian Embassy in London we finally made the story public. We hope to bring Dorian to life at the premiere in Spring 2015 in Moscow." Read more details on his Facebook. And here's the Russian press announcement. 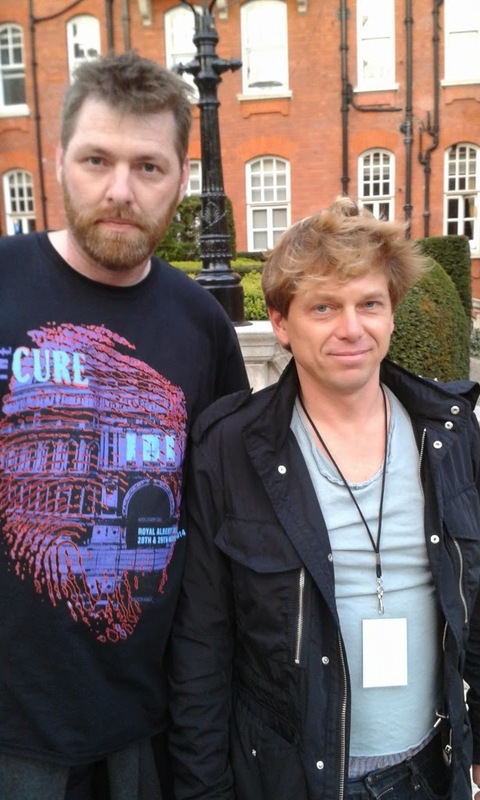 Harry (Cured70) with Jason Cooper before The Cure's RAH show on March 29th. 2 Late - London, Teenage Cancer Trust 29-Mar-2014 from itsaperfectday on Vimeo. Harold and Joe - London, Teenage Cancer Trust 29-Mar-2014 from itsaperfectday on Vimeo. From Peter van Leeuwin: "Me (on the left) and my friends with Robert (in a jolly mood) backstage at the RAH on Saturday." Robert Smith: "I don't feel the urge to beat people over the head with new material"
The Cure's frontman has been telling XFM that the band's two shows at London's Royal Albert Hall in aid of Teenage Cancer Trust were "pretty sensational"… but that his plans for the rest of 2014 are still up in the air. "We're in a weird kind of predicament," Smith told XFM's John Kennedy after coming offstage at the Albert Hall last night (Saturday 29 March). "I've finished singing and mixing an album that was made by a band that no longer exists. So I'm trying to be convinced that I should release what is the second half of an album that effectively came out in 2008. It's a bit of a sore point, to be honest. "It's not really new, I just never sang it. I couldn't be bothered. I didn't think the words were good enough, but I've re-written it. We're playing in May in American and then I don't think we'll play again until late September. So it'll probably come out in that summer 'dead air' period for albums." Robert revealed that the album was likely to be released on the Fiction label - which was the original home to The Cure between 1978 and 2000. "It seems like a nice way of squaring the circle. It's an album that is really different to anything else we've done. People who want to hear it will hear it and those that don't, don't. They'll just keep dancing to Close To Me and Love Cats." "Having said all that… I've no idea. I'm very bad at planning long term. I'm at an age where I'm enjoying what I'm doing. I don't feel such a strong urge to beat people over the head with new stuff. - Says the next Trilogy shows WILL happen, but it might not be this year. Is enjoying playing these big shows with the band. Feels like they are getting better with every show. - Says the current lineup will be recording this year. Wants to record as a live band, like last album. 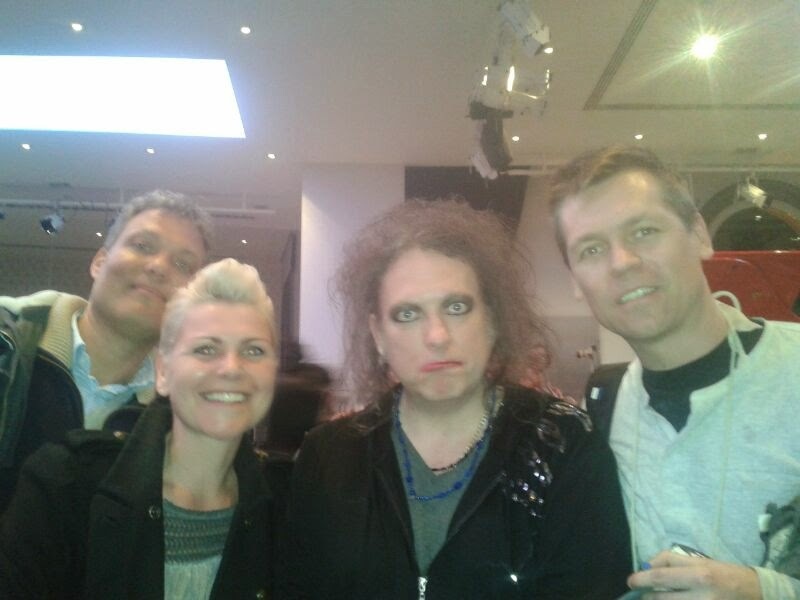 Robert and Andy at the Cure's aftershow at the RAH on March 29th. Photo from Tomgmoyse.